It works as you would expect. The Nintendo Switch has enjoyed a plethora of success ever since it launched on March 3rd, 2017, but there has been a void as big as Kirby’s mouth when it comes to streaming services and other types of applications on the system. During the early days, Nintendo reiterated that the machine was first and foremost a gaming device and that other types of apps were not a priority, and to the dismay of many they delivered on that promise. It wasn’t until November 9th, 2017 that Hulu finally launched for the system in North America (NicoNico had released first in Japan) which at last opened up the possibility of more in-demand apps to come over to the Switch, but we would have to wait another year for us to see the release of the second streaming app. And the time finally came for YouTube to launch for the Nintendo Switch on November 8th, 2018. YouTube is your usual fare when it comes to the offerings of the app. It does what you’ve pretty much come to expect from it. Searching for videos and playing them is pretty straightforward, as is logging in with your account and being able to have easy access to channels you are subscribed to or view your own content. 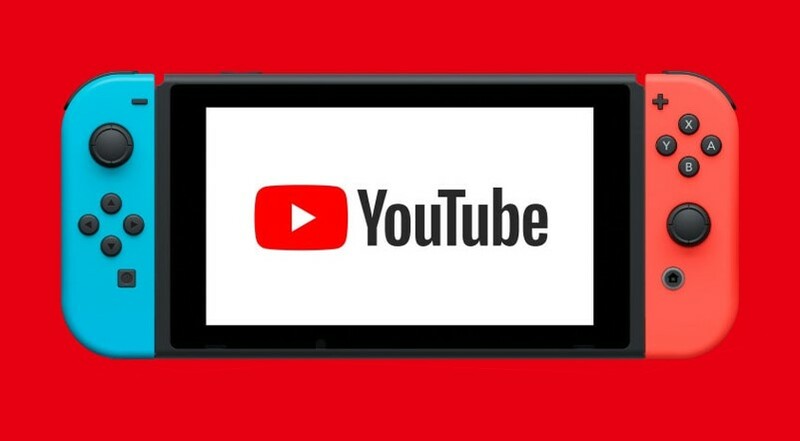 Using YouTube on the Nintendo Switch is a similar experience to how you would use it on Smart TVs or other gaming consoles (the YouTube app), and the Switch offers you a myriad of different options to navigate through the app. You can use the touchscreen to select and type, or use the Joy-Con or even the Switch Pro controller. You can also connect a keyboard to the Nintendo Switch Dock and use it to type. What you won’t find here is which is the ‘Creator’s Content’ section that is now commonplace when using YouTube on your computer web browser, and even smartphones and tablets. Using a browser on your game system could allow you to access these options (except for streaming and upload of videos), but the Switch is still missing a browser. This means that anything from Analytics, to viewing and answering messages (among other things) is missing from the experience, and something the dedicated YouTube app is able to provide in other devices like smartphones and tablets. Live streaming is also not possible on the Nintendo Switch, which is a shame since you can take screenshots and record videos for some of the games. With YouTube’s introduction on Switch I was hoping to gain some of that functionality, but live streaming your Nintendo Switch games are still strictly done through the use of a capture card. PlayStation 4 and Xbox One do not require the use of capture cards, although they limit what you can do when live streaming (Ex. not able to do intro or outro videos straight from the system). In a sense, this vanilla YouTube app limits the potential of the Nintendo Switch. It is understandable since the Switch is a gaming device, and the casual market will not even notice since they are (for the most part) not privy to the more intricate details of what tools Content Creators use, but those of us that do use them will be somewhat disappointed. Either way, it is fair to assume that most of the Switch adopters will not care about the exclusion of these options. Aside from that, the application works like advertised, and videos look clean and crisp both on the TV as well as on the Nintendo Switch screen (as long as your bandwidth permits of course), and my kids have been watching YouTube more on the Switch now that it is available on it than they do on their iPad, Smart TV or even smartphones. They feel better going from a quick game to taking a break watching videos on it, and then back to gaming. The Nintendo Switch YouTube app works as you would expect it to and for the most part, does its job well, as long as you keep your expectations in check and since it’s free and takes up hardly any space, there is no reason not to download it, if you haven’t done so already. Sergio Acevedo is a writer at Force in Unison and Miketendo64. You can also talk with him about Nintendo happenings on Twitter and listen to his Nintendo Podcast at the Force in Unison Gaming channel.